With SimpliVity OmniStack, you can start small with as few as two OmniStack nodes (for storage HA) and grow the environment as needed. This provides the flexibility of starting with a small scale proof of concept and growing to large scale production without guessing the workload and purchasing up front. The following section covers the OmniStack, XenDesktop, infrastructure and network design guidelines for XenDesktop and XenApp deployments on SimpliVity OmniStack. Compute, Storage, and Network resources for each infrastructure VM were selected using Citrix best practices as a baseline and modified based on their observed performance on the OmniStack systems. OmniStack Servers – Two 5-host vSphere Clusters comprised of OmniStack Integrated Solution with Cisco UCS C240 M4 systems to support the Office Worker desktop workload. For infrastructure, a single datastore per server is recommended to ensure even SimpliVity storage distribution across cluster members. This is less important in a 2 OmniStack server configuration; however, following this best practice guideline will ensure a smooth transition to a 3+ node OmniStack environment, should the environment grow over time. This best practice has been proven to deliver better storage performance and is highly encouraged. For desktops, an equal number of SimpliVity datastores to the number of OmniStack systems in each vSphere Cluster were deployed. In this 5+5 Federation configuration, five SimpliVity datastores were created for each vSphere Cluster. This is done to more evenly distribute storage load across the OmniStack systems in the vSphere Cluster, as well as increase the likelihood any given desktop has locality with its VMDK disk. Each datastore contains a virtual machine template and write cache files for every virtual machine. The write cache file contains all disk writes of a target device when using a write-protected vDisk (Standard Image). After 2 month LoginVSI extensive tests, I finally published this performance white paper. This white paper documents the results of SimpliVity-led testing to provide evidence of these efficiency gains on Citrix XenDesktop. Two Citrix XenDesktop provisioning methods, Machine Creation Services (MCS) and Provisioning Server (PVS), were used during the tests. All performance testing utilized Login VSI (http://www.loginvsi.com), the industry-standard load testing solution for virtualized desktop environments, and all testing configurations and results have been validated by Login VSI. These tests offer insight in to the latest performance results of Citrix XenDesktop 7.6 on SimpliVity OmniStack 3.0. The performance testing illustrates SimpliVity’s ability to deliver an excellent end-user experience in VDI deployments as the environment scales. 1. Performance at scale: Consistent, very low VSIMax Average < 2000ms measured throughout XenDesktop Hosted Shared deployments and Hosted Desktop deployments. 2. Reduce capacity and IO requirement: Inline deduplication and compression rate above 20:1. 3. With four (4) SimpliVity nodes on Hosted Shared Desktop deployments, 800 users can be supported with MCS and 1200 users can be supported with PVS RAM Cache option. 4. With four (4) SimpliVity nodes on Hosted Desktop deployments, 600 users can be supported with MCS and 800 users can be supported with PVS RAM cache option. 5. PVS “write cache on RAM with overflow to disk” option can almost eliminate IOPS. SimpliVity has built reference architecture by implementing a 4 nodes SimpliVity OmniStack as a building block. With SimpliVity solution, it is flexible to start a small Pod and scale out to thousands virtual desktops. OmniStack systems are clustered together to form pool of shared compute (CPU and memory), storage and network resources. VMWare vSphere 5.5u2 and Citrix XenDesktop 7.6 were used to provide a high performance, easy to scale and resilient virtual desktop solution. 4 x 2TB NFS datastores were used. The best practice is to create one storage group per datastore and create VMs equally cross the storage group. XenDesktop clones the master image to each datastore. Each VM has its won folder. There is a diff (delta) disk and ID disk for each VM. For MCS-based VMs, all writes goes to the diff disk. This disk can be either persistent (dedicated static desktops) or non-persistent (pooled desktops). The ID Disk is always persistent and 6MB in size. ID disk contains the identity data for example computer name or AD account and password. This information is merged into the operating system during reboot. Each datastore contains a VM template and write cache files for every VM. Write cache file contains all disk writes of a target device when using a write-protected vDisk (Standard Image). Performance at scale: Consistent, very low latency < 2000ms measured throughout XenDesktop hosted shared deployments and hosted desktop deployments. Reduce capacity and IO requirement: Inline deduplication and compression rate above 20:1. With 4 OmniStack nodes on hosted shared desktop deployments, 800 users can be supported with MCS and 1200 users can be supported with PVS RAM Cache option. With 4 OmniStack nodes on hosted desktop deployments, 600 users can be supported with MCS and 800 users can be supported with PVS RAM cache option. Boot time for 40 hosted shared VM is 7 minutes and 800 hosted VM is 16 minutes. PVS “write cache on RAM with overflow to disk” option can almost eliminate IOPS. Utilizing Simplivity OmniStack hyperverged infrastructure dramatically simplies IT systems management. OmniStack’s Data Virtualization Platform delivers industry-leading data efficiency, global unified management and built-in data protection. For VDI environments, Simplivity provides an unmatched user experience without compromising desktop density or resiliency. The data center technology has been changing. We have gone through standalone server, shared storage, virtualization, flash and now hyperconverged infrastructure. Traditional data centers have different IT groups to manage server, network and storage. Customers are asking for central management, less moving parts, quick deployment and linear scale out. Hyperconverged infrastructure made it possible to merge these silo systems and management structure. Customers can purchase and get support from one vendor. SimpliVity OmniStack is a software-defined hyper-converged infrastructure solution. OmniStack runs on x86 industry standard servers to deliver turnkey hyper-converged infrastructure for the software-defined data center. Clustering multiple OmniStack-powered hyperconverged infrastructure units forms a shared resource pool and delivers high availability, mobility, and efficient scaling of performance and capacity. SimpliVity OmniStack assimilates all IT infrastructure and services below the hypervisor into a single, scalable 2U building block. Two or more instances of OmniStack-powered hyperconverged building blocks deployed together form a federation—delivering a massively-scalable pool of shared resources. The solution runs on commodity servers OEMed by SimpliVity under the SimpliVity OmniCube brand name and with third-party servers, including Cisco UCS and Lenovo System X servers, under the SimpliVity OmniStack name. OVC – OmniCube Virtual Controller – A virtual machine is deployed and pinned to the host servicing an NFS datastore to the ESXi kernel. OVC uses DirectPath I/O for the local SCSI controller and the OA. Manages all aspects of SVTFS file system. Maintains a read cache in OVC’s memory. Multiple OVCs in a VMware Datacenter present a unified namespace of storage across all OmniCubes within that Datacenter as a vSphere Datastore. OA – OmniStack Accelerator – Acknowledges writes, performs data efficiency operations, manages metadata and works with OVC to store metadata in the SSD pool. DRAM is used for transient data. Super capacitors are used to de- stage DRAM to Flash in the event of a power failure. Cache and Metadata SSD Pool – SSD drives (number and sizes vary based on OC model) protected with RAID1 or RAID5 using a local SCSI controller – provides read cache and metadata storage. Capacity Pool – HDD drives (number and sizes vary based on OC model) protected with RAID6 using a local SCSI controller. You can modular scale out your virtual desktop and application deployments with hyper-converged infrastructure which has three unique attributes: accelerated data efficiency, built-in data protection functionality and global unified management capabilities. Next blog I would like to share hyper-converged infrastructure with virtual desktop deployment. In the first deployment scenario, we validated 2,000 nonpersistent desktops with a Citrix XenDesktop– hosted VDI and XenApp-hosted shared desktop workloads. In the second deployment scenario, we validated 2,000 persistent desktops with NetApp full-clone desktops that were cloned by using VMware® vStorage APIs for Array Integration (VAAI). In both of these scenarios, we were able to demonstrate that, regardless of the deployment use case, the NetApp All-Flash FAS solution can eliminate the most common barriers to virtual desktop adoption, especially the concern about high storage costs. The testing covered common administrative tasks on 2,000 desktops (or on 4,000 desktops when tests were performed in a storage controller failed-over state). Including tasks such as mass virtual machine (VM) provisioning, boot storms, login storms, and steady-state operations made it possible to understand time to complete, storage response, and storage utilization. For the persistent desktop use case, we also tested virus scanning and patching of 2,000 desktops at the same time with the intent of understanding the time to complete the operation, storage response, and storage utilization. Citrix Synergy 2015 is just around the corner, and we can’t wait to share what we’ve been working on with Citrix, as well as some insight to what is coming soon! 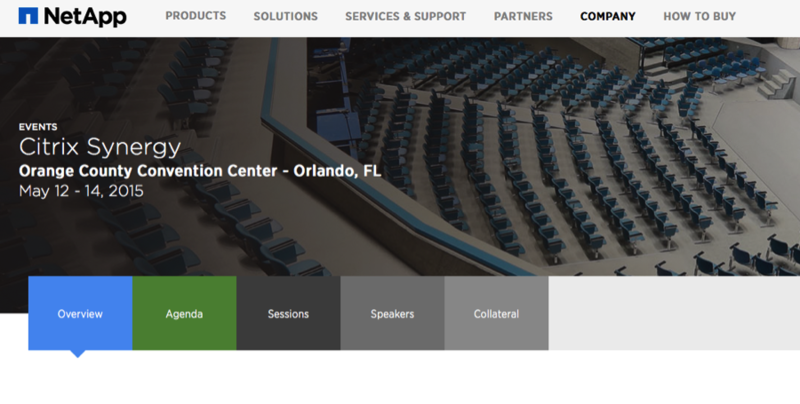 If you’re interested in understanding how to provide mobile solutions to your customers, you need to come by the NetApp booth (#307) at Synergy in Orlando May 12 – 14. Storage is a key component to successful desktop virtualization, file sharing, and cloud solutions, which enable true enterprise mobility for your customers. Enterprise mobility can be simplified with NetApp Data Fabric, which helps you securely store, access, share and archive data consistently across the datacenter of your choice. Two other topics we’ll be covering in detail include desktop virtualization with NetApp performance optimized, always on data reduction using our all flash FAS systems and our new solutions and demos showcasing our work with Citrix, NVIDIA and Cisco for demanding visualization needs the high end users. Denver Health is the only safety net hospital (safety net hospitals typically provide care to low-income and/or uninsured patients) in the US to be ranked in the top 10 in overall quality among 117 leading academic hospitals in the US. We are proud and excited to share that David Boone of Denver Health has a dedicated session to describe how Denver’s primary hospital uses NetApp and Citrix to make IT more efficient by identifying and eliminating inefficient processes while supporting 1500 virtual desktops. This session is on Thursday, May 14 at 8:30 a.m.
Stop by the NetApp booth #307 and learn about solutions for Citrix including all-flash storage for high performance desktop virtualization and rapid deployment with FlexPod Datacenter. Learn how NetApp can help you reduce costs and improve reliability as you deliver applications, data, and services across your Citrix mobile environment.